Welcome to the Euroserie Supertwin Top gas homepage. Thirteen teams were present at the short airstrip in Alkersleben, Germany for the second Race in the Euroserie. It was the first time for the riders of the european super twin top gas serie at the track in Alkersleben in the east Germany. The event is a streetlegal race since 11 years and got the approval from DMSB to perform a real drag race event this year. This big step couldn't be done without some trouble! First the riders noticed some steps and ditches on the access to the pits and the return road, that they were not able to pass with the wheeliebar equiped bikes. This problems were solved quickly, but the poor grip on the track was a longer lasting problem. Some days before the event took place we have already been informed that the track was shortened in case of very poor grip in the start area. So we were able to race a 1/8 mile only for safety reasons! The scrutineering started at thursday evening for the early birds. Jolink, Schleichert and Brodbeck for example. Friday there were 2 testruns in the morning and 2 qualifying rounds in the afternoon. Sadly Brodbeck broke his gearbox again in the first testrun. A new team on the entrylist were the Roadbreaker Motorsport e.V. The guys around teammanager Stefan are highly motivated. They will use this year as a test season and want to compete regulary next year. Saturday 4 qualification rounds were done. Our champion Jörg Lymant set some impressive low 5 sec. runs on the track while everybody else struggled with wheelspin. A very big surprise for everybody was the strong appearance of Olaf Menzi. The guy from Switzerland qualified second with a solid 5.39, Lymant's best was a 5.25. 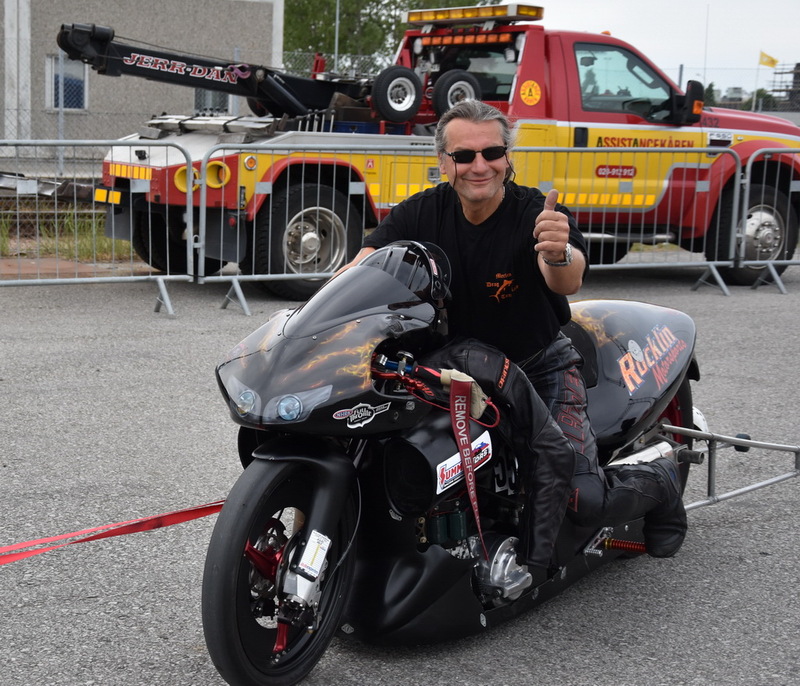 Malte Foit was unable to compete on sunday, a bend intake valve stoppped the Buell. After a long and sunny weekend Lymant was the winner and Menzi is runner up. The quickest guy on the track was also Lymant with 5.15 and fastest too with 222,91. Sadly some irritations occured at the end for the winners, when there were no trophies prepared for the top gas class!!! After some discussions Mr. Hinkel will send the highly deserved trophies for Lymant, Menzi and Gerd Caspari, who finished third on the podium. Well done guys! 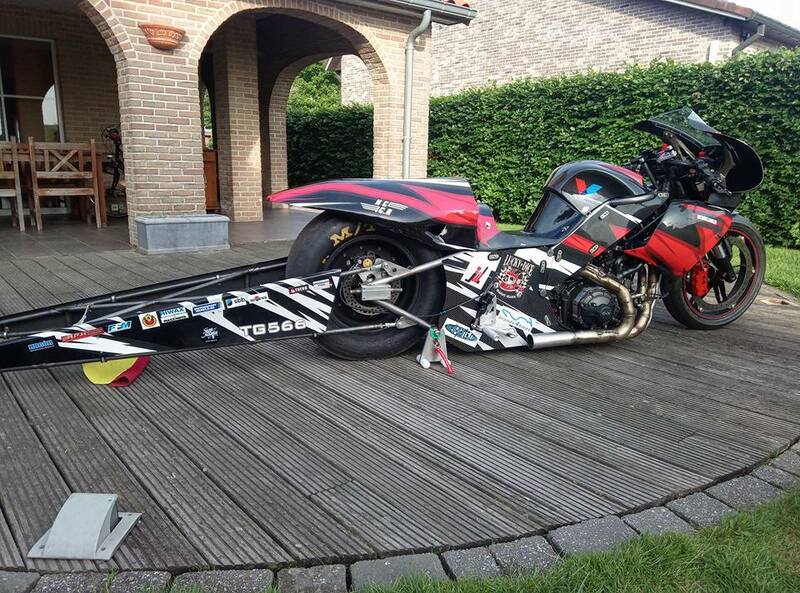 Dirk Waterschoot from Belgium came to Alkersleben with a Rotax powered dragbike that he built last winter. Dirk also planned to race in the French championship this year. 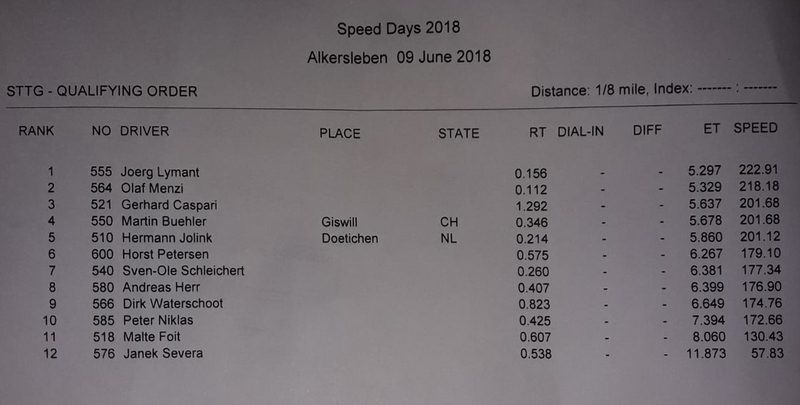 Race #2: Speeddays, Alkersleben, Germany: 07-10 june. 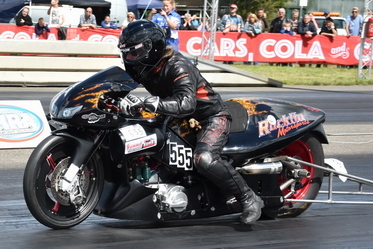 Race #3: Drag day, Hoškovice, Czech Rep: 23-24 june. Race : 4: Main Event, Drachten, The Netherlands: 27-29 july. Race #5: Hockenheim, Germany: 16-19 August. Race #6 Mosten Raceday, Denmark: 31 august - 2 september. The five best results of these six races will count for the 2018 Euroserie championship. If any of them gets cancelled, the spare race (SRIF, Malmö, 7-9 september) will be a valid race. If you want to join in and need a good bike to compete, check the 4sale section. 16.-18. August, Dutch Finals Drachten NL Cancelled!!! The best six results count for the 2013 championship. 20-21-22 july: Dutch Open Drachten NL Cancelled!!! The six best results count for the 2011 championship. Best six results count for the 2010 championship. This were he race dates for the euroserie supertwin topgas 2009. Best six results count for the championship. Testing and tuning can be done in Hockenheim on 9-10 aug.
Don't forget to check the 4sale section, there are a lot of fast bikes on it now and many parts. Official 1/4 mile record: 7.393 sec. Official 1/8 mile record: 4.654 sec.